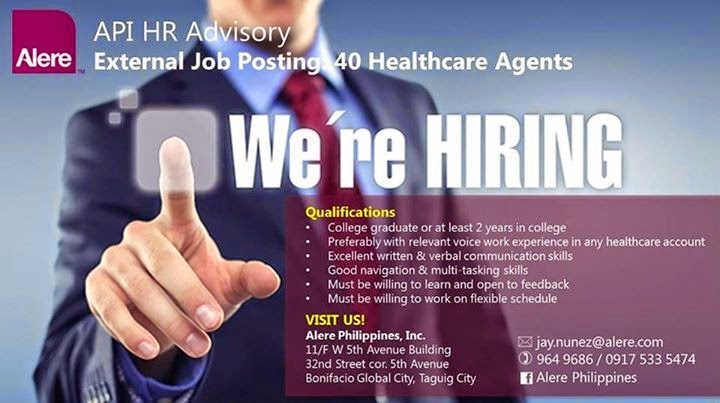 Be part of a pioneer account ALERE Inc. one of the newest BPO/Inhouse companies is looking for 40 Healthcare Call Center Employees. According to sources ALERE Inc. opened a facility at BGC in Taguig. The company's target is to hire 1000 employees that will provide healthcare process management services. So, if you have voice work experience in any healthcare account and you want to apply visit Alere Philippines Inc at 11/F W Fifth Avenue Building, 32nd St. cor. 5th Ave., Bonifacio Global City, Taguig City. Check the photo above for details and you can also check their Facebook page for other available job positions Based on the map below ALERE's office is near S&R Shopping and St. Lukes Global City. Finding a Job for Blue Collar Worker is too difficult! PayJobs offers blue collar job openings in Philippines. If you are looking for blue collar jobs in Navotas, Pateros, San Juan, Piñas and Parañaque, visit us.